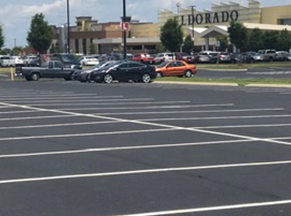 Parking Lot Striping – If the lines on your parking lot have faded, bad things can happen. 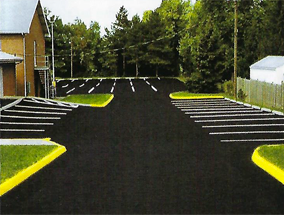 Trust Lazer Sharp Parking Lot Services to add structure and safety to your lot with our excellent striping services. Sealcoating – With our 1,000 gallon sealcoat truck, there is no sealcoating job too small or too large for us. 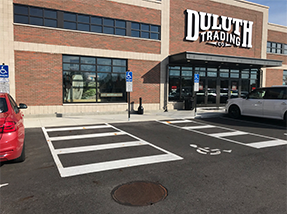 We sealcoat lots from restaurants to shopping centers. 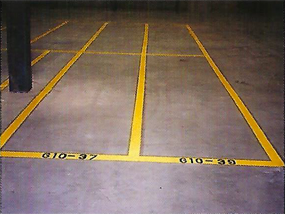 Indoor Warehouse Marking – if the lines on your parking lot have faded, bad things can happen. 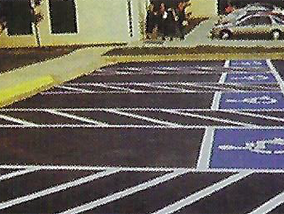 Trust Lazer Sharp Parking Lot Services to add structure and safety to your lot with our excellent striping services. Crack Filling – if the lines on your parking lot have faded, bad things can happen. 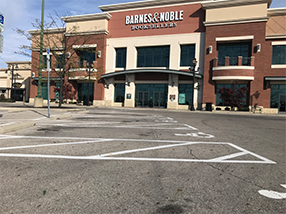 Trust Lazer Sharp Parking Lot Services to add structure and safety to your lot with our excellent striping services. Count on Lazer Sharp Parking Lot Services do to the job right the first time and every time. 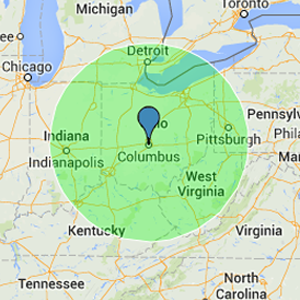 Our service area includes Ohio and a radius of Pittsburgh, Indianapolis, Louisville, Detroit and beyond. This includes Kentucky, Pennsylvania, Michigan and Indiana. In the winter months, we don’t hesitate to travel as far down as Georgia. We are fully insured for our mutual protection and in our many years of experience we have seen a thing or two in this business. Nothing beats the experience of a qualified company with a great history and track record of performance. Make sure the company you decide to use has enough of the right insurance. We will be more than happy to provide you proof of insurance and documentation.